I have a number of movie files that will not open and play with my QuickTme player even though they are .avi files. How could I fix this? I'm trying to play an avi file on MacBook with Quicktime and the DivX Player. The picture looks fine but the audio won't play. How to solve it? Problem that QuickTime won't play AVI wouldn't be the first to befall you. Your complain about AVI playback issue will end here. Besides, reasons why your AVI files won't play on QuickTime are also explained. Can QuickTime Play AVI Files? 1. If you get the message "filename .avi file could not be opened. A required codec isn't available." You shall understand AVI, in fact, is a kind of container format, which can be compressed by a number of codecs, including MJPEG, MPEG-4, MPEG-3, MPEG-1, MPEG-H etc. QuickTime can't play AVI video compressed with MPEG-4, MPEG-HD etc other than Motion JPEG video. 2. QuickTime can't play AVI file with audio sound. QT does not recognize the audio in this video because the audio codec is not supported by QuickTime. 3. Some users reported that QuickTime no longer played AVI file after having updated to new Mac OS X. The installed codec or Perian are the issues that cause AVI file not playing on QT. Perian may not be compatible with the new OS you upgraded to. Note: macOS will soon no longer be able to run 32-bit programs. This means QuickTime Pro 7 won't run fine on the new OS after Mojave. You have to find a replacement to play the video or convert AVI video to MP4 format that other portable devices accept. How to Fix QuickTime not playing AVI file on MacBook Air/Pro/iMac Windows? 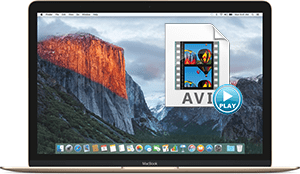 QuickTime not playing AVI file for unaccepted video audio codec can be solved by a good AVI converter, MacX Video Converter Pro, which gives perfect AVI to QuickTime conversion performances in output quality, converting speed, ease of use and stability. The QT won't play AVI issue will be solved easily as it will convert AVI to QuickTime MOV, avi to mp4, m4v and other supported format, video audio codec. with no image audio quality loss, and the fastest speed. After that, all the AVI files become playable in QuickTime. Follow the guidance on how to play AVI on QuickTime correctly needless of third-party codec. The robust video converter is also fully compatible with macOS Sierra, Win 10, solving issue that QuickTime can't play AVI on Sierra, El Capitan, Yosemite, Win 10. Click to download AVI to QuickTime video converter for Mac, or download windows full version, run it. Step 1: Click "Add File" icon to load AVI file not playable on QuickTime. AVI of any video audio codec, 720p, 1080p, 4K UHD, 8K, VR 360 is all supported. Step 2: Choose a QuickTime format from popping-up Output Profile window, such as MP4, AVI, MOV etc. is recommended for smooth QuickTime AVI playback. Step 3: Click "Browse" to select a folder to save converted AVI file. Step 4: Click "RUN" button to start to convert AVI to QuickTime and play AVI on QuickTime without error. It's similar to import AVI to iMovie, FCP, etc. You can also directly switch to other alternatives if you are not happy with QuickTime. They are the AVI file players, like VLC (we are all familiar with it), 5KPlayer, the latter of which is a new media player that is highly praised for its stunning video music playback effects, multiple file types support. It can play AVI file on Mac Windows and help get rid of QuickTime won't play AVI troubles. You can download best AVI player for Mac here or download for Windows, run it, and click "Video" button to load AVI video to play. It plays 720P, 1080P, 2160P 4K UHD VR AVI file compressed with any codec, MJPEG, MPEG-4, MPEG-3, MPEG-1, MPEG-H, MJPEG requiring no codec component, freeing you from QuickTime not playing AVI file. 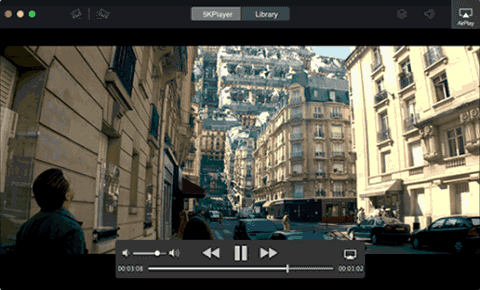 Perian, free, open source QuickTime component, will help issue that QuickTime can't play AVI as it supports plenty many commonly used media video file, like AVI, MKV, DivX, etc. With the video codec component package installed, you may find that AVI file plays on QuickTime probably. Can QuickTime play AVI of any type using Perian? It's a pity that not all AVI files are playable on QT. Note: Perian project was shut down in 2012 and only support QuickTime for OS X Mavericks or older. That's why QuickTime stops playing AVI with Perian installed after updating to macOS Sierra, OS X 10.11 El Capitan. To play AVI on MacBook/iMac correctly running macOS Sierra or El Capitan, go to QuickTime not playing AVI solutions listed above. Quicktime won't accept AVI file due to format incompatibility issue. You can follow the guide to convert AVI to MOV format for playing on QuickTime. Follow the tutorial to freely encode AVI file to MP4 format for playing on Mac, iPhone, iPad, and so on. Do you want to watch AVI videos on Mac? Free download the best AVI player on your macOS and view the files on your Macbook, iMac without video format issue. MacX Video Converter Pro is an all-in-one AVI to QuickTime video conversion program with top quality and fast speed. With the aid of this feature-rich video converter, you are allowed to convert various HD or SD AVI videos to QuickTime.